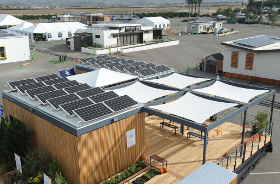 NexusHaus, built by the University of Texas at Austin and Technische Universitaet Muenchen, placed fourth overall at the U.S. Department of Energy Solar Decathlon 2015. The team tied for first place in the Energy Balance Contest, and placed second in Affordability and third in Engineering. Following the competition, NexusHaus returned to Texas so it could join the Solar Decathlon 2007 BLOOMhouse at the university’s McDonald Observatory. Both are now being used to house scientists, researchers, and visiting scholars.